Our cell phones are fast becoming our go-to devices for every aspect of our daily life, but it can be hard to use them for everything without a phone stand. They are our alarm clocks in the morning, they guide us on our way to work using GPS to track the fastest route, and they can even pay for our morning coffee. We then use them to keep in touch with our customers, friends, and family, make purchases, do the banking, read a book, or even listen to the radio. What was once a device for making phone calls has turned into a mini computer that makes our lives more convenient than they’ve ever been before. However, without a phone stand, they are known to be cumbersome. They won’t sit on your desk nicely in the office, nor will they be perched waiting to set your alarm off in the morning. A phone stand for your desk can make all the difference to how convenient your phone is, and can even help make it useful for other areas of your life, such as watching movies or reading a recipe in the kitchen. 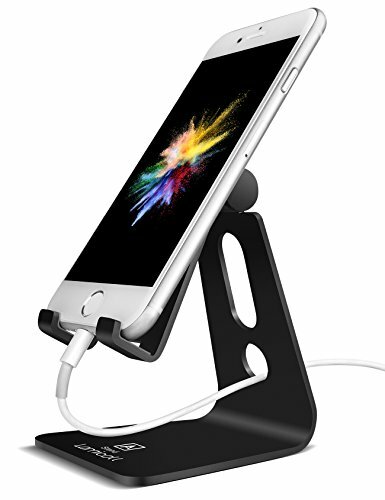 Knowing there is now a demand to take the regular cell phone to the next level, we’ve included nine top-rated phone stands for desks. Choosing one just might change the way in which you use your mobile devices. 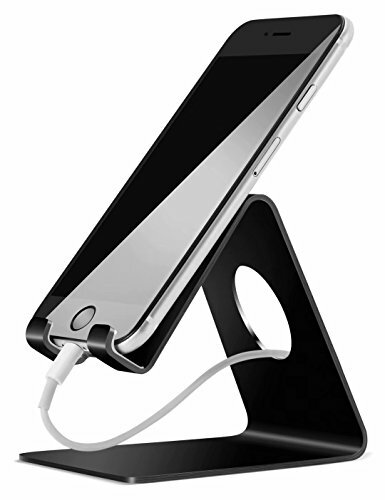 If you’re tired of hearing the “whack” as your phone drops onto your desk after being perched against something, then you need a phone stand for your desk. This Lamicall phone stand might just tick all the boxes. It’s compatible with a range of devices, such as iPhones and Androids between four and eight inches in size, and it even suits the larger devices such as Sony, or Note. This compatibility enables you to get the most out of the phone stand, meaning your device will fit snug and secure whenever you need it to. One of the main benefits of this phone stand, aside from its ease of use, is how well made it is. It’s constructed out of black aluminum alloy, has smooth edges, is lightweight, yet remains balanced to avoid tipping your device over. 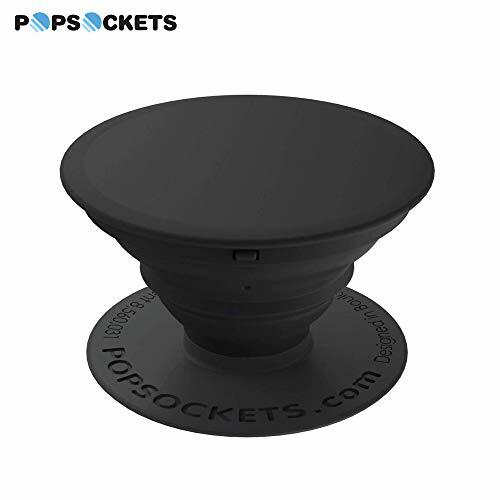 It has a low center of gravity as well, which means that along with the rubber hooks to keep it in place, your phone won’t fall out, scratch, or slide about in the phone stand on your desk. This phone stand has also been made with your app needs in mind. It’s the perfect angle for watching YouTube, using FaceTime with family, checking emails, or cooking a recipe in the kitchen. There’s no need to hold or touch your device; it will just sit snug and secure. There’s every reason why this phone stand for desks will tick all the boxes for your requirements. Gaming has taken on a whole new angle with phones of today, so the need for a phone stand has become greater. With this RonXer phone stand, you’re able to benefit from a multi-angle design that enables you to choose how you watch movies or play games. It’s suitable for a range of devices – such as iPhones and Android devices, and can even cater to iPads, tablets, and Nintendo switches as well. Rest assured your devices stay firmly in place too, with the robust aluminum frame and anti-slip silicone that grips and holds it well. When it comes to versatility, this phone stand for your desk ticks all the boxes here too. It folds up for easy storage in your pocket, and even comes with a neat carry bag, also. Take it to the office, leave it at home, or travel out of town. You can do anything with this phone stand for the more comfortable use of your electronic devices. If you’re worried about regular phone stands causing scratches and not being secure, you might prefer this Aquiv Silicoe phone stand for your desk instead. Made from superior silicone, it doesn’t slide around, doesn’t scratch, and doesn’t move. Rather than just protecting the front from scratches like many other phone stands, this one also protects the back. There’s no need to worry about putting your device in a case. Not everyone wants to view their device from the same angle, so this phone stand also enables you to adjust it to suit. It’s multi-angle, meaning it can be turned and changed to ensure you’re able to watch movies, video clips, and read recipes in a way that suits your needs. This Aquiv phone stand is also compatible with a range of devices. Use it with your Android or iPhone device, or even your tablet and iPad. The sky’s the limit, and you can rest assured that whatever device you use, it will fit securely. Along with the phone stand itself, you also receive a ring or key stand. 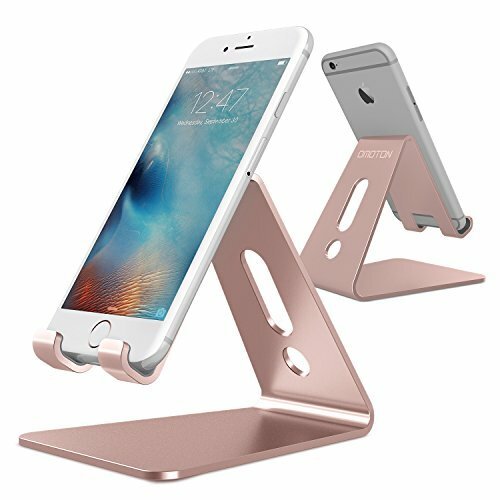 This can sit beside the phone stand to hold your valuables, and once you’re finished, it slides neatly into the phone stand. Robust, secure, and made from heavy reinforced silicone, there’s every reason to consider this phone stand for your desk today. 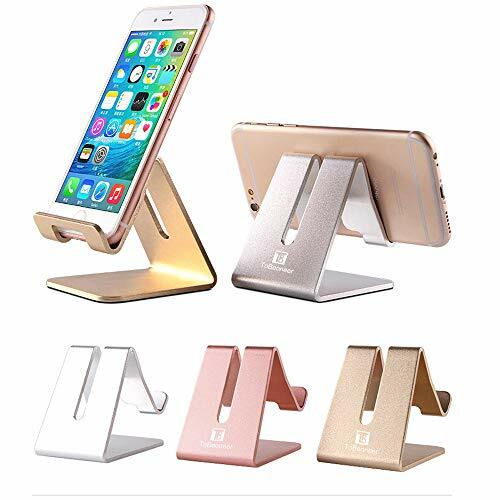 If you want your phone stand on your desk to stand out from the crowd, consider choosing this Aibocn multi-angle phone stand. Available in green, black, and silver, it’s aesthetically pleasing as well as just functional. This phone stand is suitable for all manner of electronic devices – from a cell phone all the way through to a tablet, iPad, or E-reader. As such, you can use it for reading, watching movies, browsing the web, or reading a recipe as you cook in the kitchen. If you’re worried about the security of your device, there’s no need. Not only will this phone stand hold your phone securely in place, but it does so with rubber coating to protect it from scratches, wear, and tear. It’s even capable of holding a 12-pound device securely, with minimal to no movement. Known for its versatility, you can also choose the angle at which you view. Move it up, or down, install the phone sideways for ease of charging, or just sit it on your desk at typing height, there’s no limit to what you can do with this universal phone stand. It even comes with a 1-year warranty and 100 percent satisfaction guaranteed for your peace of mind. Most phone stands on the market are designed for flat surfaces such as a desk, or a kitchen bench. However, this Leesin phone and tablet stand is suitable for all kinds of surfaces. Not only does it not have a solid base, but it has long legs and unique rotor design for use in every situation. 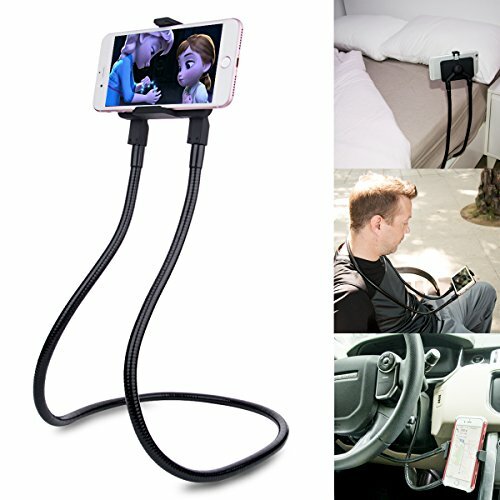 From lounging in the pool to lying on your bed, or on the sofa, just pop the stand on top of you and have a hands-free viewing of movies, books, and more. The gooseneck legs are bendy, which means that even when you view your device in bed, you can adjust the legs to be sturdy – even on the softest of surfaces. The height and the width are also adjustable, it’s made from high-quality materials to keep your tablet or phone secure, and it even has silicone tape that enables you to adjust the length, so you’re viewing it at the angle and height you want. There has never been a more convenient way of using your electronic device until now, and it’s entirely customizable to suit your exact requirements. 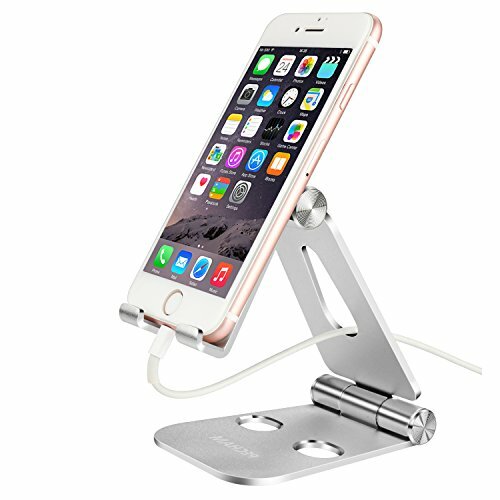 Whether you’re at home or in the office, you’re sure to love the convenience and quality of this DY Ryer phone stand for desks. Not only is it compatible with your Android or iPhone devices – among other brands as well – but it can also be used with tablets and iPads, as well. Any device that’s between four and 11 inches wide will snug and secure within this DY Ryer product. Aside from being well made, with a flexible aluminum arm that can pan and rotate, this phone stand also offers 360 degrees of rotation. Move it up, down, or around, and reap the rewards of not being confined to the one position, as is typical of many other phone stands for desks. View your device in a portrait position for recipes, or why not switch to landscape for movies? No matter which way you position your device, it’s going to sit securely in place. This phone stand is also suitable for a range of situations. Whether you’re cooking at home and need a convenient position to read the recipes, or you need a bulk amount of display stands in your showroom, you’re sure to notice how well this phone stand can come to the party. There’s every reason to put it near the top of your wish list. This futuristic Simeon phone stand is more than just a holder for your phone. Not only can it cater to most brands between four inches and 12 inches in size, but it’s available in a range of colors to suit your device or your décor. Choose from blue, green, orange, pink, purple, black-blue, and black-green. Most other phone stands for desks on the market don’t give you the option to choose, but with Simeon, the possibilities are endless. Aside from its color variety, this universal phone stand is also very affordable, while being suitable for landscape and portrait devices. Just choose your preference, and feel at ease knowing the solid plastic construction, anti-slip silicone, and soft rubber feet will keep it secure at all times. You can even choose your angle, with many different settings available, as well as the ability to swivel it as you need to. If style, safety, security, and versatility all appeal, this phone stand for your desk will well and truly tick all the boxes. Just choose your color, attach your phone, and start viewing hands-free today. Available in aqua, black, pink and purple, this phone stand is unlike any other on the market, and you’re sure to be impressed. Not only is it not a standard ‘L’ shaped phone stand, but it’s a large cushion that will hold your device up while keeping it secure and safe from scratches at the same time. Similar to a bag, it features a mesh pocket for an iPad or tablet, then to the side, has a pocket for your phone as well. It will hold most tablets, E-readers or iPads securely, all the while being made of soft fleece for additional peace of mind. To further add to the convenience, it has extra pockets for chargers and USB cables, as well as a snap-on handle for you to attach it to your bag or suitcase for travel. It’s soft, secure, and is sure to be a welcome addition to your office, or wherever you are on the road. If you like to stand out from the crowd, and you like all your devices to as well, it might be time to invest in a Honsky phone stand for your desk. Not only does this phone stand look different than any other on the market with its peaks and contours, but it also comes in a range of different colors. The best part is, it’s available as a 3-pack so you can share them with your friends! Aside from its range of color choices, this phone stand is suitable for a variety of uncased devices. While it won’t hold your cell phone if it’s in a bulky case, it will take care of your uncased device, without scratching it or damaging it in any way. It can handle the weight of both a tablet or a phone, and has a handy swivel hinge and durable plastic construction, as well. 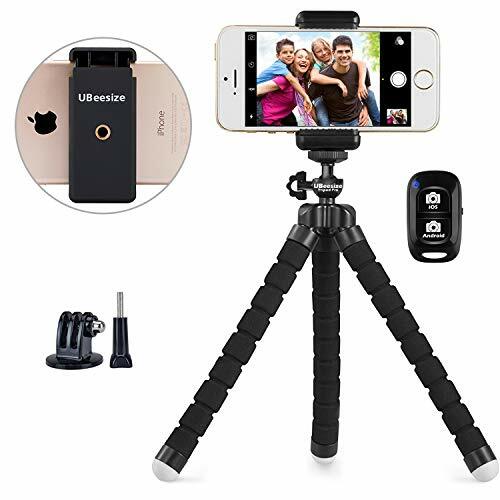 It’s perfect for traveling, as it’s compact enough to fit in your purse, and can also hold your device in a portrait position, or in the landscape position, too. 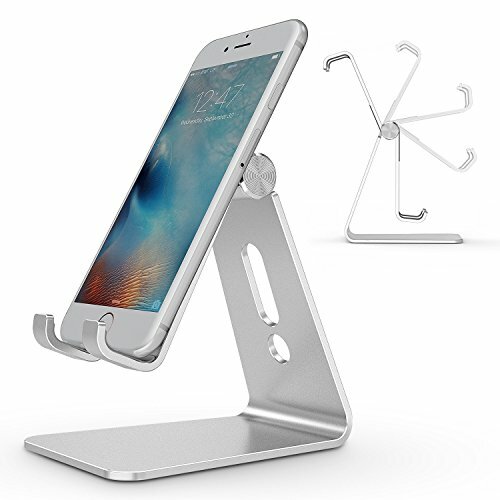 Whether you’ve got an iPhone, Android, Nokia, Blackberry or even an iPad, you’re sure to find this phone stand for desks suits your device just perfectly.